The back to school period is one of the most important for marketers and retailers in general. Regarding spending, the time only comes second to the festive season. Children have to buy school supplies for the next year, and parents are prepared to give their kids the best they can – this translates into a vast pool of willing buyers. Affiliate marketers can make the most of this period by applying some smart marketing strategies to capture the attention of both parents and students alike. However, despite the fact that school supplies will be in demand at this time, without proper knowledge of how to tap into this group, a marketer may lose a great opportunity to make money from them. 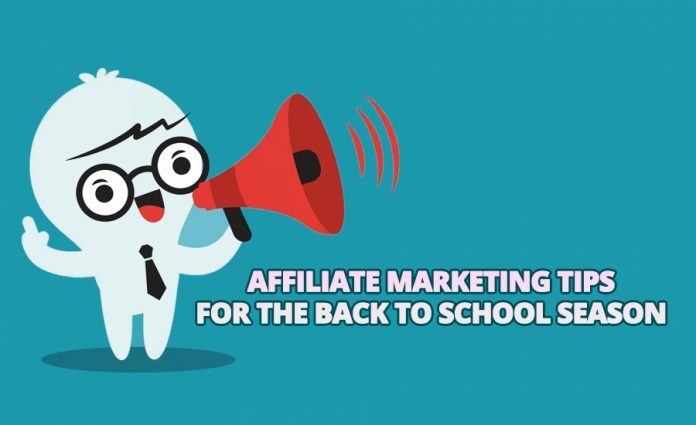 Here are some school marketing tips for affiliate marketers. These are the categories that attract a lot of sales in the back to school season. Affiliate marketers should look for vendors who deal with these. Smart marketing for affiliate marketers at this time includes knowing how best to reach students, teachers and parents. Students tend to spend a lot of their online time on their mobile devices, apart from wanting to keep in touch with friends and classmates on chat and social media, they conduct back to school searches on their handheld devices too. A smart affiliate marketer should optimise all landing pages for mobile browsing. This in an inpatient demographic, so the landing page should give information fast, and in a manner that appeals to students. Parents and teachers should also be considered, but the primary emphasis should be on the fast-browsing student population. Students, teachers and parents spend a lot of time on sites like YouTube looking for advice on the best supplies to buy for the coming school year. A smart affiliate marketer should be able to create videos that will get attention on YouTube and other video sites. It is widely known that video is getting more click than any other media. Today, it is playing a great role in bringing in traffic to website and blogs. The video has to be well created and interesting. Do take time to formulate your video and know exactly what people are looking for in this season and then aesthetically place these products in your video. A good example is to be found in the fact that parents want their children to have the best accommodation possible. This means looking for hostels need dorms that offer such accommodation and creating a tour video that will be appealing to parents and students alike. Parents, teachers and students are a busy lot at this time of the year. Evening and nighttime hours are the best time to reach these potential customers because this is when they have finished their daytime activities and have time to browse or school-related supplies. This is crucial to affiliate marketers when looking for vendors to represent. Every shopper looks for the best deals when buying products and services online, so affiliate marketers should look for suppliers that are offering the best deals. The vendors could be thrift stores or local small business owners. Discount stores and department stores get a high volume of sales, especially for apparel. Thrift stores get a lot of sales for books. Analyze data from vendors and the use it to create content for each. It is a well-known fact that students spend a lot of time on social media. You can leverage this fact to send attractive offers on social media about the products that you have on offer. Make sure that you use imagery and videos well, to get the best attention and shares. Social media marketing can virally grow the sales of an affiliate marketer if proper research and consideration go into the creation of the content. Marketing videos and images should be created appealingly to encourage sharing. Sharing on social media is an aspect that an affiliate marketer should always keep in mind when creating content. Certain school-related supplies are in high demand at different times of the year. Get to know when stationery is highly in demand – this is usually the period just before a new school year. Get to know when cosmetics and retail items are in demand – This includes a computer, mobile devices, the latest makeup and other items determined by peer pressure. Get to know when clothing is in high demand – after holidays, students want to come back looking like they have been reinvented. They will spend a lot of money on new clothes – basically, what the latest trend is. Affiliate marketers need to keep abreast of what matters most to students just before they go back to school. Blog and social media posts should relate to the students to get the best results. Affiliate marketers need to be creative and appeal to this demographic to get a high sales volume. The back to school season is a great time for affiliate marketers to make money from selling school-related items. Parents, teachers and students are the target customers, and marketers should create content that targets each of these groups. Although parents and teachers may influence spending decisions, the primary demographic to focus on is the students themselves. They will always ask their parents to buy what they want and not what the parents think is best for them.